There is seemingly no end to the diversity of short-horned grasshoppers, family Acrididae, here in Colorado. 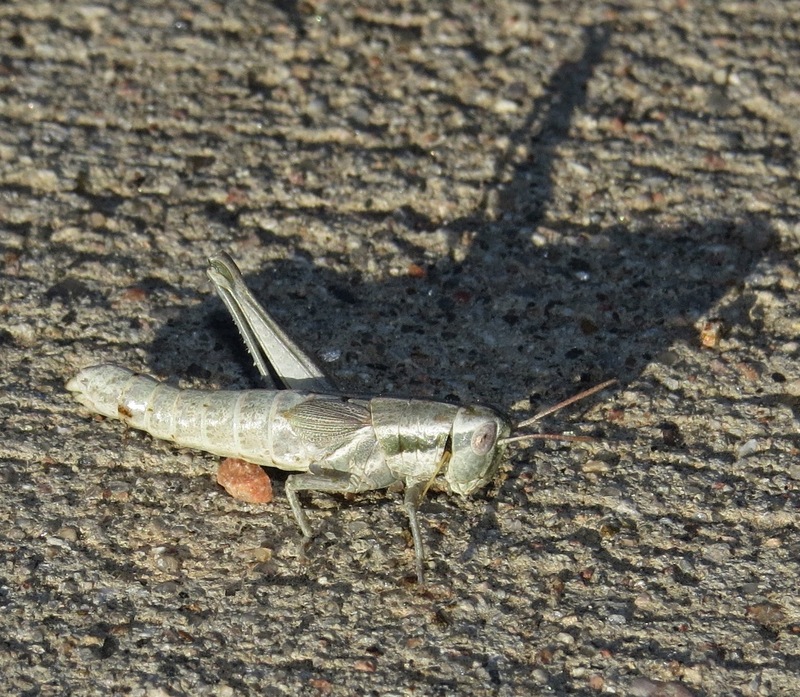 Hiking the Rock Island Trail, a concrete bicycle path through east Colorado Springs, I added the thirty-ninth species of acridid I've seen here. Initially, I thought it might be a freshly-molted specimen of a familiar species since it was so very pale. On closer examination it proved to be a well-hardened adult of the Cudweed Grasshopper, Hypochlora alba. Here it was, very late in autumn on October 24, yet there were still large numbers of grasshoppers present in the scrub and grassland habitat along a sandstone ridge that parallels the trail. Vegetation here is a little different than on the plains proper. Sure, there is still yucca, prickly-pear cacti, and rabbitbrush, but also Gambel's Oak, elm trees, cottonwoods, and other plants characteristic of upland habitats. Insect diversity is correspondingly unique. The Cudweed Grasshopper, also known as the "Mugwort Grasshopper," is not a large insect. Males average 15 millimeters, females like this one only 20 millimeters, maybe slightly larger. This is decidedly a species of the Great Plains, found from southern Saskatchewan and Manitoba south through eastern Wyoming and Colorado to extreme western Minnesota, most of Iowa, Kansas, extreme northwest Missouri, Oklahoma, and north-central Texas. 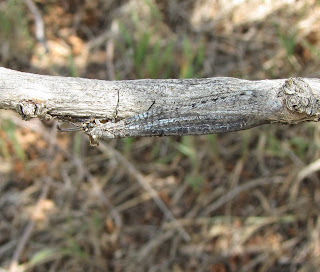 Adult specimens occur late in the season, from August through October. What makes Hypochlora alba truly unique is that it is *not* a generalist feeder. 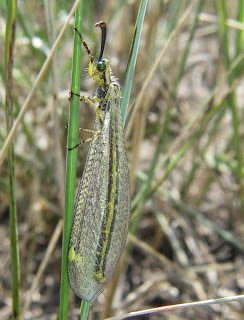 While most 'hoppers enjoy munching various grasses and/or broadleaved herbs, the Cudweed Grasshopper feeds almost exclusively on Cudweed Sagewort, Artemisia ludoviciana. At least, it certainly doesn't stray far from other Artemisia species. 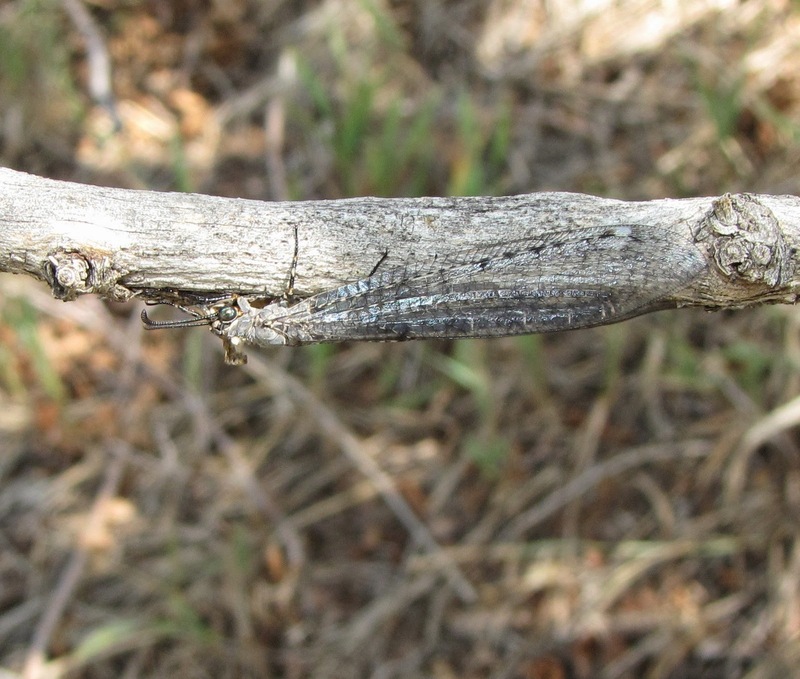 A. ludoviciana is a silvery-gray plant that also goes by the aliases "Silver Wormwood," "White Sagebrush," "Western Mugwort," and "Gray Sagewort" among others. I had to look it up online and I'm still not sure that it looks familiar. Then again, my "search image" is usually for insects, not plants. One cannot always choose the best specimens as photographic subjects, and such is the case here. This is a female, missing one hind leg. She *is* an adult, though, despite the short wings. Many spur-throated grasshoppers in the subfamily Melanoplinae are short-winged, or have short-winged individuals or populations, which can make identifying them problematic, especially for novice entomologists. Further, species identification often hinges on the configuration of the male genitalia, cerci, and subgenital plate. Females don't have all of this....hardware. 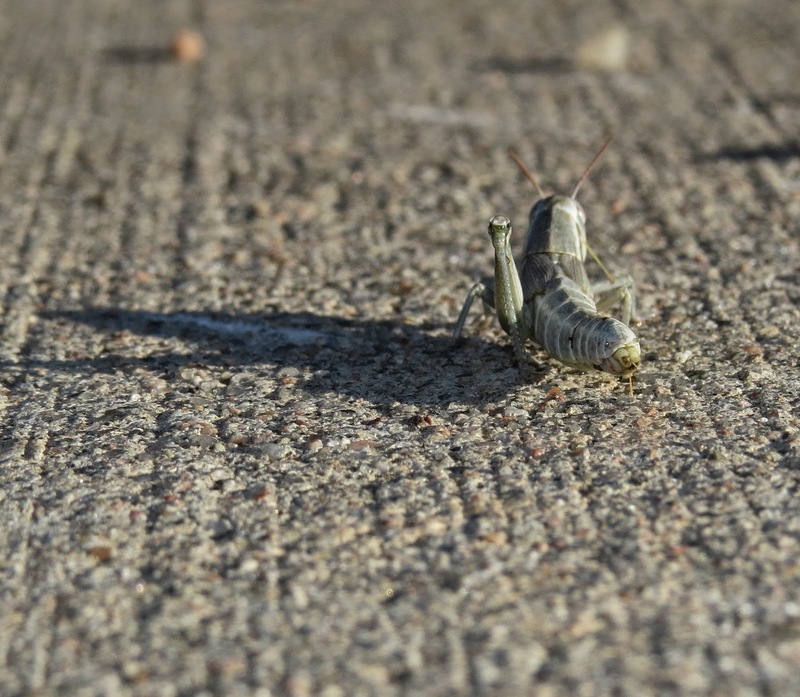 I have to say I admire the subtle beauty of grasshoppers. They are supremely adapted to their habitat and food plants, so it takes patience and persistence to even notice them most of the time. Go take a look in your own neighborhood and see how many species you can find. You will be surprised, I guarantee it. Ferguson, David J. 2010. "Species Hypochlora alba - Mugwort Grasshopper," Bugguide.net. Helfer, Jacques R. 1972. How to Know the Grasshoppers, Cockroaches, and Their Allies (2nd edition). Dubuque, Iowa: Wm. C. Brown Company Publishers. 357 pp. That was my reaction when I learned the identity of a tiny beetle that I found back on October 14. I posted the image you see below to the Facebook group "Friends of Coleoptera at the Natural History Museum [London]" in hopes that someone might recognize it. Michael Geiser, Tommy McElrath, and Jong-Seok Park quickly agreed that it was a corylophid. 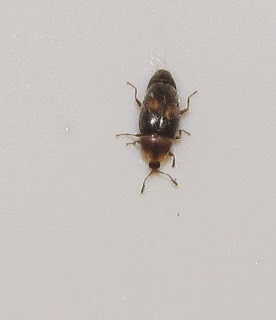 I had never even heard of the family Corylophidae until then; and the common names "minute hooded beetles" and "minute fungus beetles" didn't ring any bells, either. That's how it goes in entomology if you are a generalist with limited knowledge of specific orders. You are guaranteed to be baffled half the time by what you find. My eyesight is so bad now that in the field I barely recognized the critter as an animate object, let alone a beetle. The thing measures about two (2) millimeters, and the only reason I noticed it at all was that it was crawling on the base of a tall, plastic-covered utility box of some kind (for electrical or cable I assume), beneath a large cottonwood tree in our residential Colorado Springs neighborhood. I coaxed the critter into a vial so I could take a few more images indoors. Consulting several references, I learned a little more about corylophid (Korry-LO-fid) beetles. There are 61 species in ten genera (plural of "genus") found north of Mexico, and my particular specimen probably belongs in the genus Clypastraea. 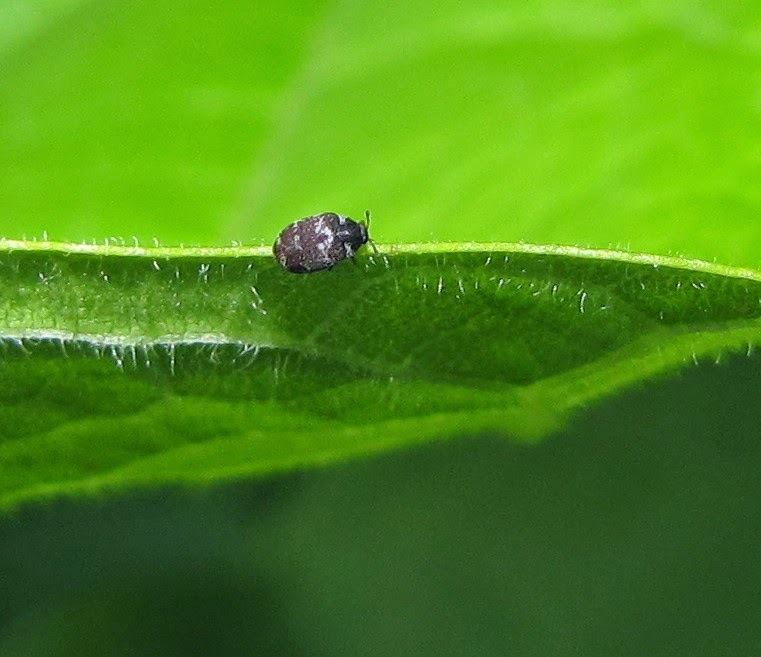 Collectively, minute hooded beetles are generally very small (surprise! ), and have the head concealed by a shelf-like projection of the pronotum (top of thorax). They feed as larvae and adults on fungal spores. 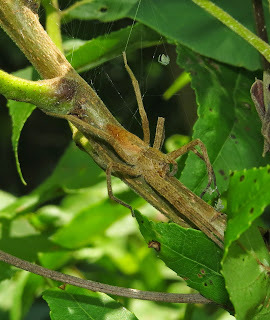 Different genera and species find such morsels in a variety of habitats from the surfaces of leaves and flowers to crevices in bark, or nests of birds, or in leaf litter. Clypastraea is apparently most often found in fungi and mold in rotting wood and under bark on dead trees. I have learned not to ignore the small insects, as that is where the real diversity and strangeness occurs. Finding a whole new (to me) family of beetles is a really exciting experience, one I hope that my readers will share in during their own searching. Sources: Arnett, Ross H., Jr., Michael C. Thomas, Paul E. Skelley, and J. Howard Frank, editors. 2002. American Beetles Vol. 2, Polyphaga: Scarabaeoidea through Curculionoidea. Boca Raton, FL: CRC Press. 861 pp. Evans, Arthur V. 2014. 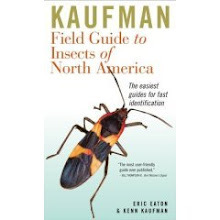 Beetles of Eastern North America. Princeton, NJ: Princeton University Press. 560 pp. Earlier this year I was fortunate enough to report a species of dragonfly never before seen in Colorado. Last Monday, October 20, I got lucky again, with a Fremont County record for the Black-fronted Forktail, Ischnura denticollis. 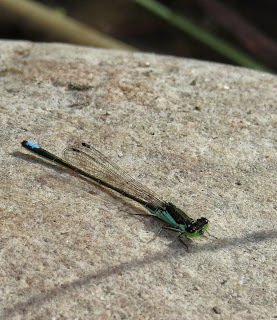 This is a type of damselfly in the family Coenagrionidae. I can only take credit for spotting the insect in the field, along the edge of a backwater pond in John Griffin Regional Park, Cañon City, Colorado. It was clearly a male damselfly, perched on a rock by the shore, with nearby cattails. The area is part of the "Riverwalk" along the Arkansas River. 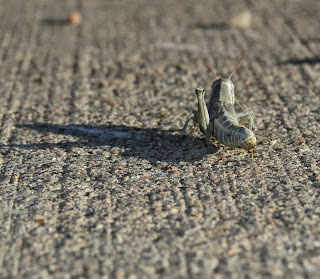 I decided to snap a few pictures, if only because insects in general were few and far between that day. Also, the rock was the steadiest object with the gusty winds that were blowing. 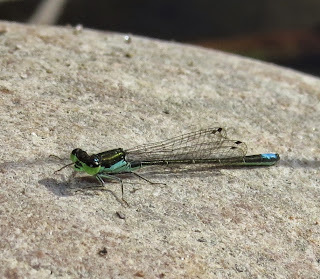 Anyway, I didn't think much about the whole encounter, except that I was puzzled by a forktail that did not have the usual requisite blue or green spots (or stripes) on the back of the thorax. Oh, well. Once we returned home, it was my wife, Heidi, that took it upon herself to look up the diminutive (22-26 mm in body length) creature online and in books we have in our library. "Hey," she said, "I think that damselfly might be something pretty cool." She had already consulted several resources by this time, and concluded that it was an unusual geographic location, and therefore a potential county record. I uploaded my own images, cropped them, and posted them on Facebook to group pages where I know dragonfly and damselfly experts lurk. Sure enough, it was determined to be a Black-fronted Forktail, a county record, and an exceptionally late date of observation. Males of this species are pretty easily identified. Besides lacking pale markings on the dorsum (top) of the thorax, the blue on the abdominal segments 8 and 9 is restricted to a spot on the top, instead of a ring around the entire couple of segments. 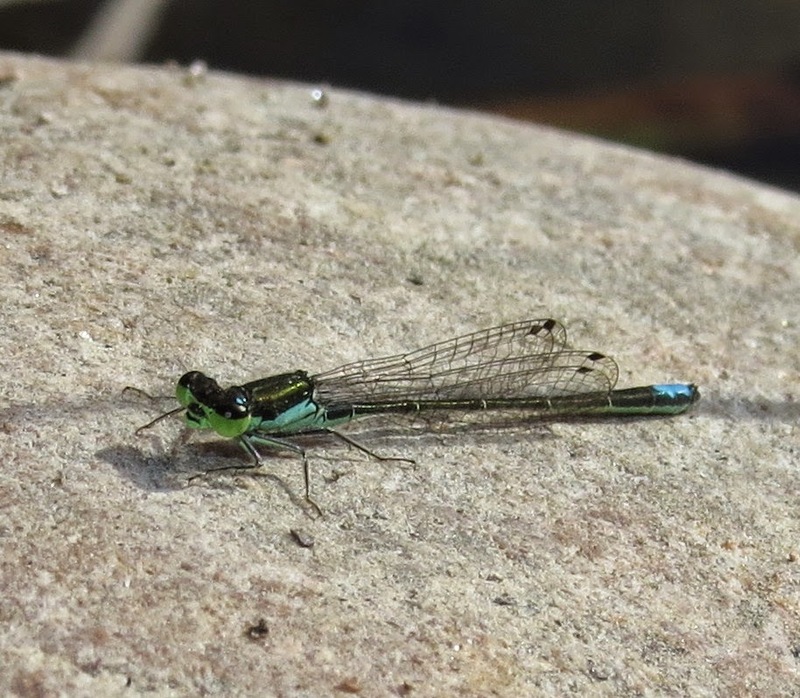 Unfortunately, females are much more difficult to identify, resembling several other forktails. 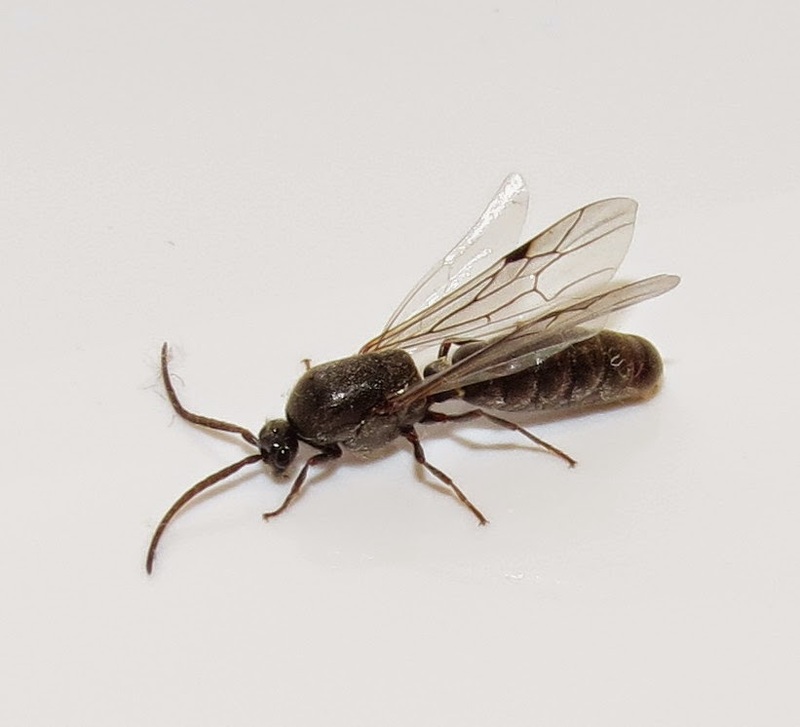 The late date is perhaps not too much of a surprise because these are oddly long-lived insects as adults, persisting about six weeks in some instances. At least one specimen was shown to have lived 42 days. The Black-fronted Forktail is a decidedly western species, ranging from southeast Oregon and southwest Idaho through California, Nevada, western Utah, Arizona, and New Mexico. It does not occur in the Cascade, Sierra Nevada, or Rocky Mountains, but creeps north again into eastern Colorado, on out to west Texas, Oklahoma, and Kansas. Look for adults on the wing at almost any time of the year in the southerly reaches of this forktail's range, but reliably between about April and October just about anywhere else. They hang out around springs, both hot and cold, ponds with lots of emergent vegetation, and even very slow-moving stretches of streams. Sources: Abbott, J.C. 2006-2014. Odonata Central: an online resource for the distribution and identification of Odonata. DuBois, Robert. 2010. Dragonflies & Damselflies of the Rocky Mountains. Duluth, MN: Kollath+Stensaas Publishing. 301 pp. Paulson, Dennis. 2009. Dragonflies and Damselflies of the West. Princeton, NJ: Princeton University Press. 535 pp. At least once each year I am asked about spider-like creatures that jump, living in someone's basement, cellar, shed, garage, or home. People don't like to get too close to spidery-looking things, so sometimes the inquiring individual includes a picture, but often not. No matter, it is almost always "camel crickets" they are describing, from the family Rhaphidophoridae in the order Orthoptera. 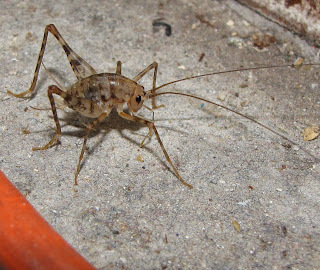 The common name of "camel cricket" may describe their hump-backed appearance, but these are not true crickets. Adults are wingless, for one thing, and thus unable to "sing." 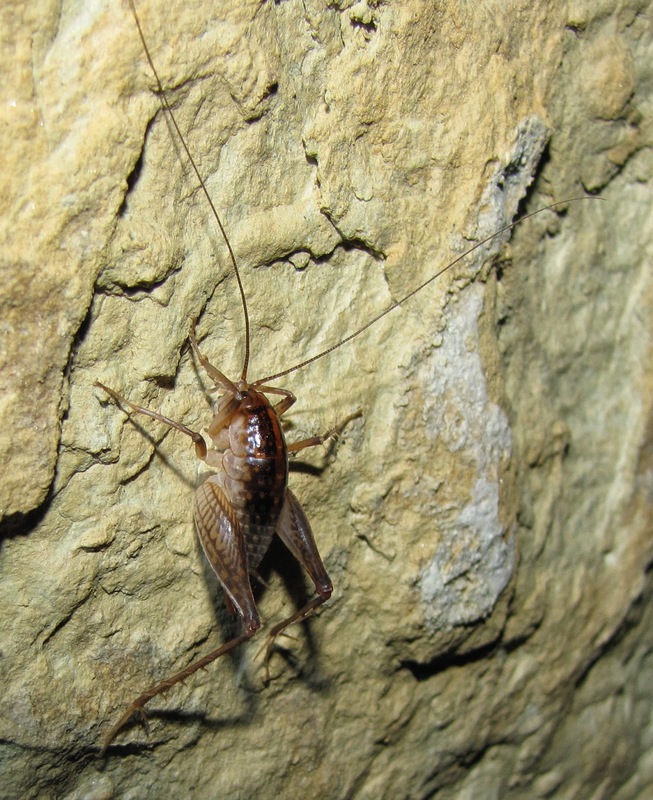 The exceptionally long antennae give these insects a sensory advantage in the perpetually cool, damp, dark habitats they mostly prefer: old wells, cellars, mine shafts, rodent burrows, basements, and caves (to which they owe their other common name, "cave crickets"). Adult camel crickets can be fairly large, with a body length varying from 9-35 millimeters depending on the species. The average legspan is even greater, which makes the whole insect appear larger. This can be intimidating to the average homeowner, no question. 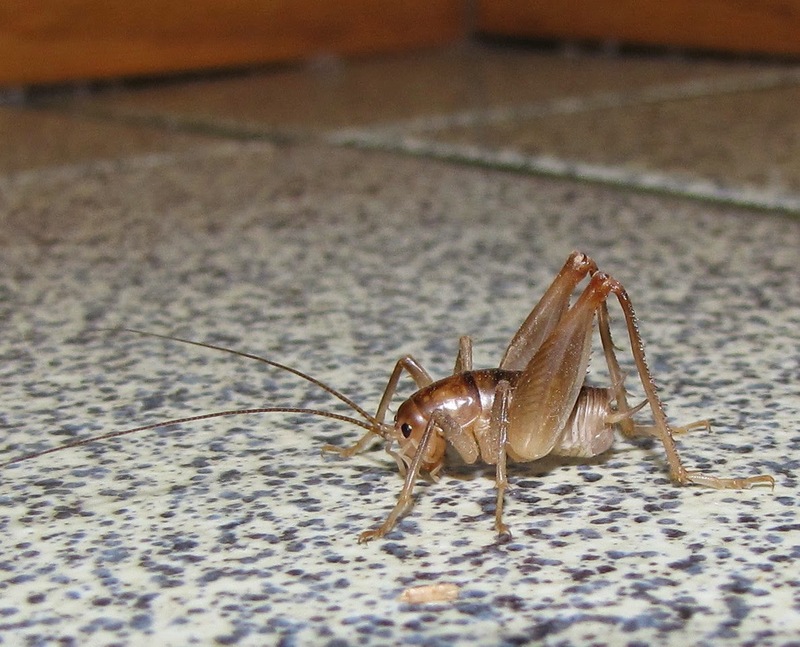 Fortunately, camel crickets are not dangerous in the least, and rarely even do damage to property. 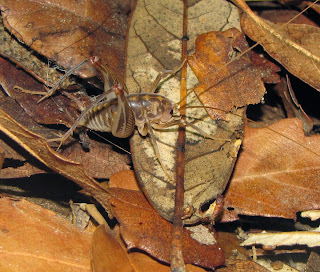 Female camel crickets do bear a blade-like organ called an ovipositor that protrudes from the rear of the abdomen. This sword-like "tail" is often mistaken for some kind of stinger, but in reality it functions to insert eggs in the soil. 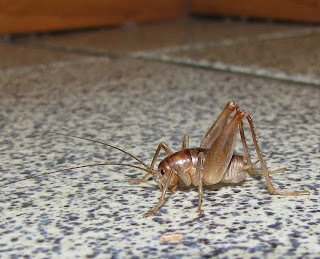 Larger camel crickets can probably give you a good nip with their jaws, but good luck catching one. 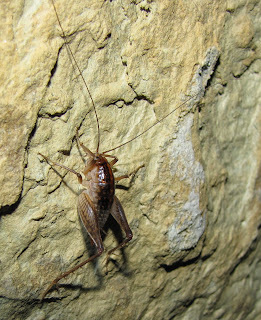 Many camel crickets can jump several feet when disturbed. Like most members of the order Orthoptera, camel crickets are ominvorous. They feed on virtually anything organic, but have been known to damage paper products and occasionally fabrics. Some species are pests in mushroom-growing operations. Camel crickets will also capture and eat other insects and invertebrates, especially those that are injured or otherwise weakened. 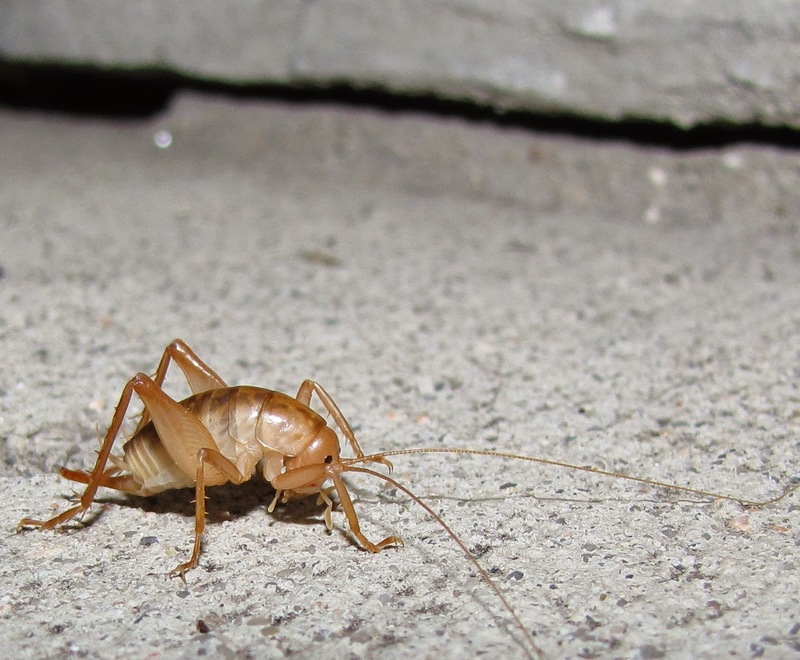 Since camel crickets are highly moisture-dependent, keeping the below-ground areas of your home dry will discourage them from colonizing. They are not social in the sense of ants or bees, but seem to enjoy each other's company. 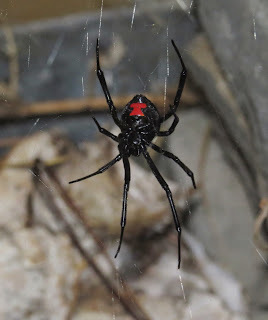 Large numbers of them are often found hiding together under boards, stones, bricks, logs, leaf litter, and other debris. There are roughly 150 species, in 21 genera (plural of genus), found in North America north of Mexico. Many of these are specialist species found only in cave systems, sand dunes, and similar geographically-isolated habitats. The "sand-treader" camel crickets, for example, are restricted to dunes, and equipped with long spines or "sand baskets" on their legs that help them dig in the soft, shifting sands. These and other arid-land inhabiting species are more robust and compact than their leggy forest- and cave-dwelling relatives. They are important scavengers of animal droppings and dried vegetable matter. 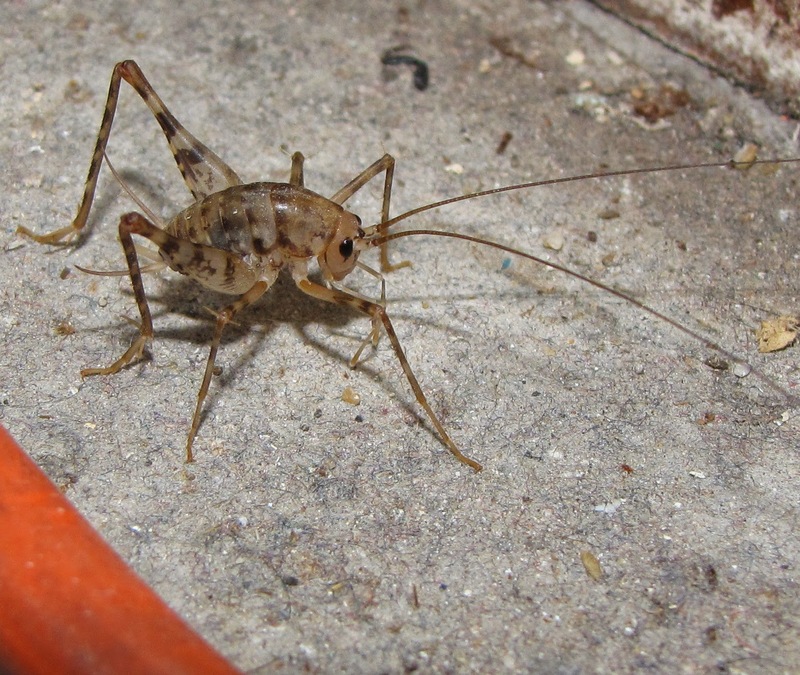 The Greenhouse Stone Cricket, Diestrammena asynamora, is native to China and other parts of Asia, but was established here in North America before 1900. 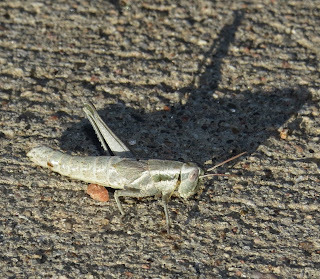 This is fast becoming the most frequently-encountered camel cricket in urban areas east of the Rocky Mountains. As the name implies, it can do occasional damage to vulnerable young plants inside greenhouses. 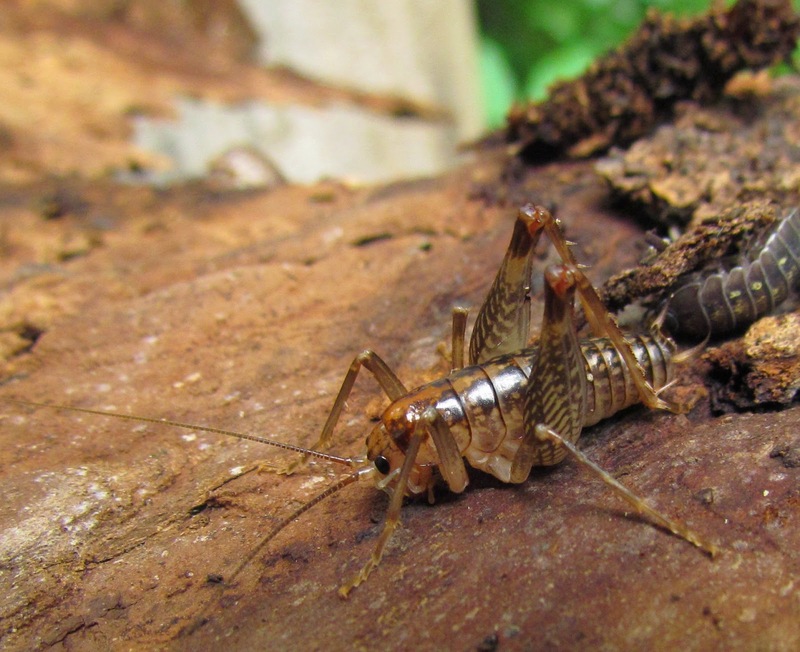 Our most common native camel crickets belong to the genus Ceuthophilus, which includes about 90 species. 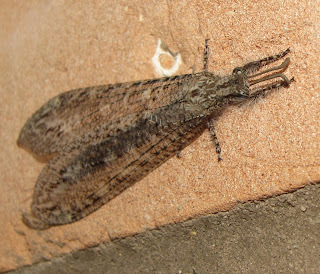 I often find them at night, clinging to the exterior of buildings, or clambering over rock walls, in rural areas. 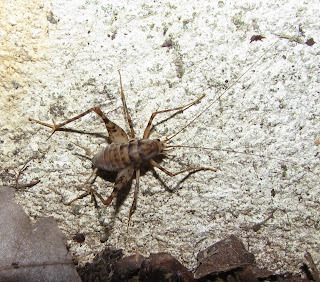 Nighttime is definitely the right time to find camel crickets in general, when the venture from their daytime shelters. 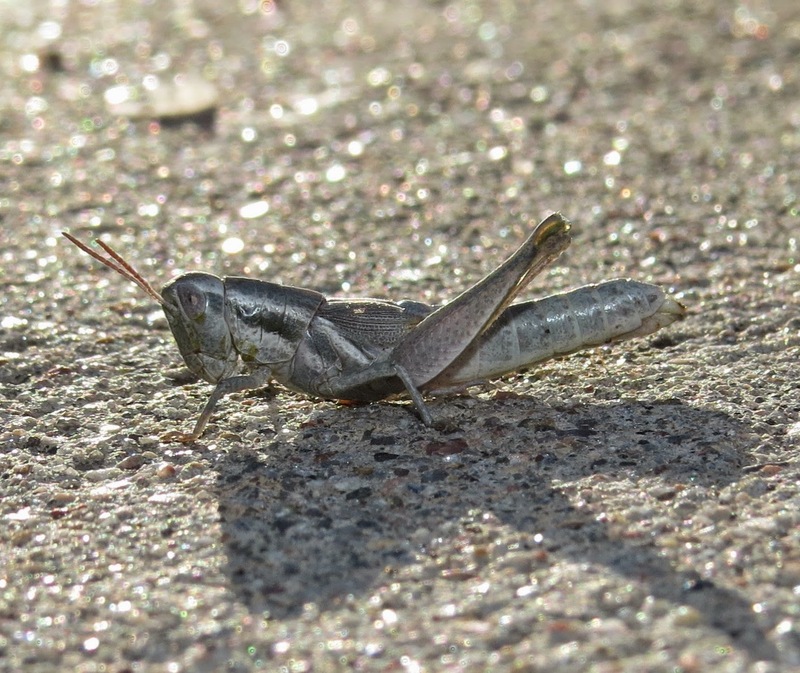 Entomologists attract camel crickets by laying a trail of dry oatmeal and returning at night to look for the insects. Molasses is also used as an attractant, smeared on tree trunks and logs. Indoors, camel crickets may be grazing on mold, mildew, and fungi, so it might be wise to inspect for potential problems with those agents of decay should camel crickets appear in abundance. Sources: Bartlett, Troy, et al. 2014. "Family Rhaphidophoridae - Camel Crickets," Bugguide.net. Bland, Roger G. 2003. 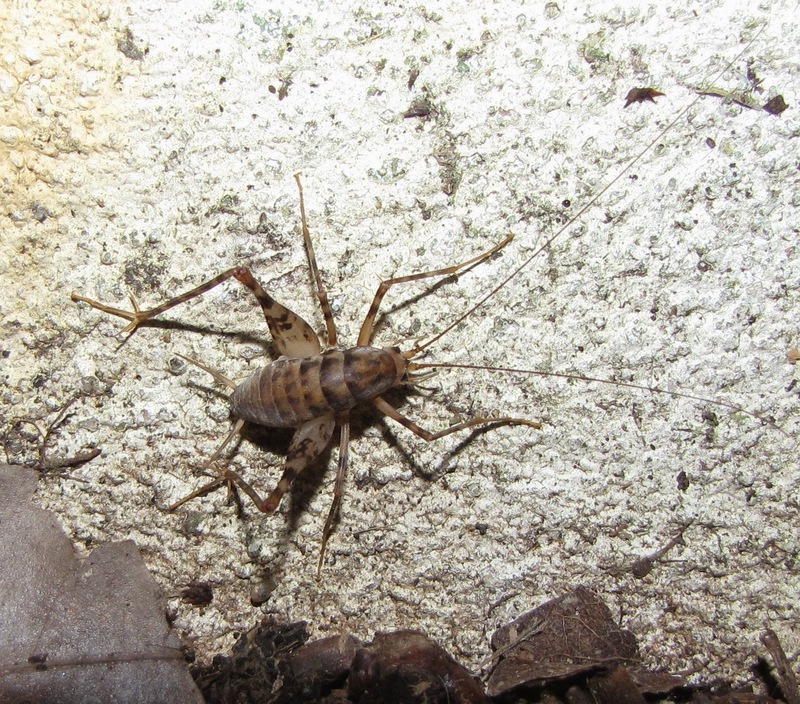 The Orthoptera of Michigan - Biology, Keys, and Descriptions of Grashoppers, Katydids, and Crickets. East Lansing: Michigan State University Extension. Extension Bulletin E-2815. 220 pp. Helfer, Jacques R. 1972. How to Know the Grasshoppers, Cockroaches, and Their Allies (2nd Ed.). Dubuque, Iowa: Wm. C. Brown Company Publishers. 359 pp. Preston-Mafham, Ken. 1990. Grasshoppers & Mantids of the World. London: Blandford (Cassell plc). 192 pp. Growing up in Oregon, all I knew initially of antlions was what I read in books. 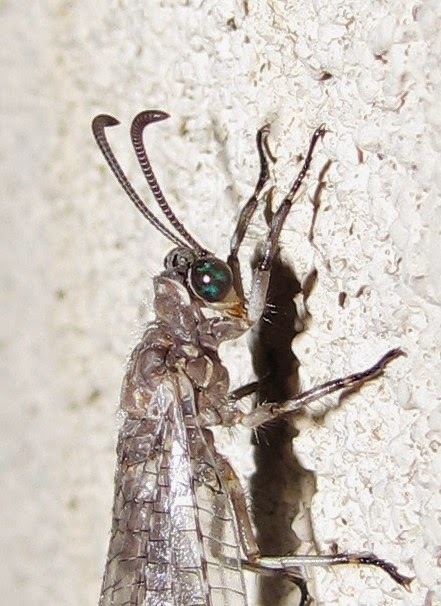 The insects are members of the family Myrmeleontidae in the order Neuroptera. 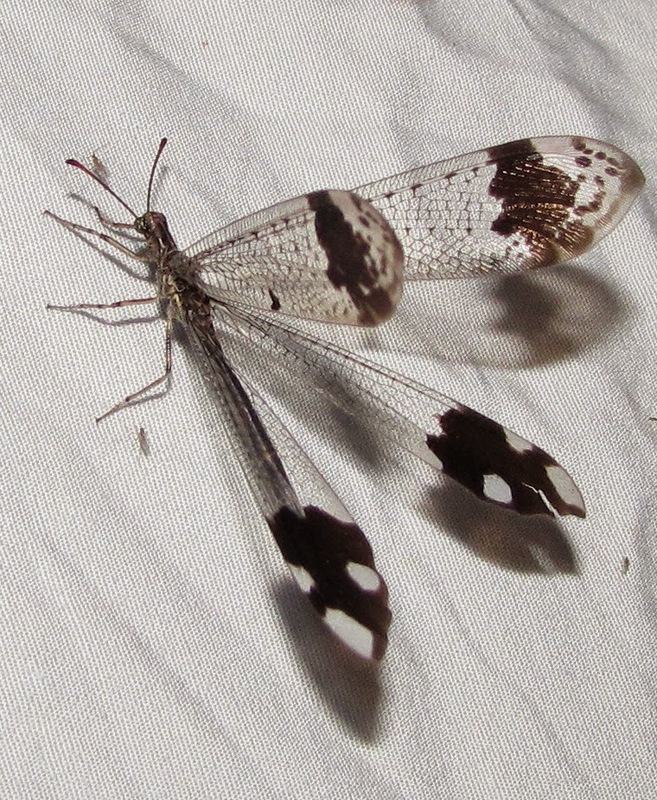 So, they are related to lacewings, mantispids, spongillaflies, and their kin. 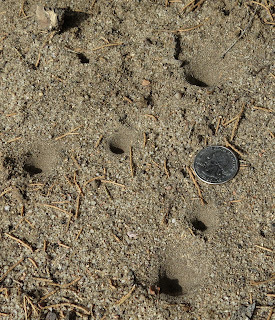 I wasn't even sure antlions could be found in the Pacific Northwest, but I was fascinated by the "pits" that the larvae supposedly dug to trap ants and other insects. The images in books never gave a sense of scale, so I imagined that the funnel-like holes must approach the size of a saucer. Ha! Most antlion pits are about the diameter of a quarter, as shown in the image below. 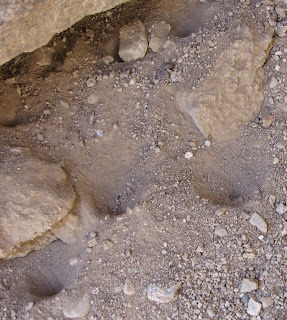 Sometimes they are larger, but the size of the crater does not correspond to the size of the larva that digs it. The breadth and depth has more to do with soil texture, and whether there is a slope or not. 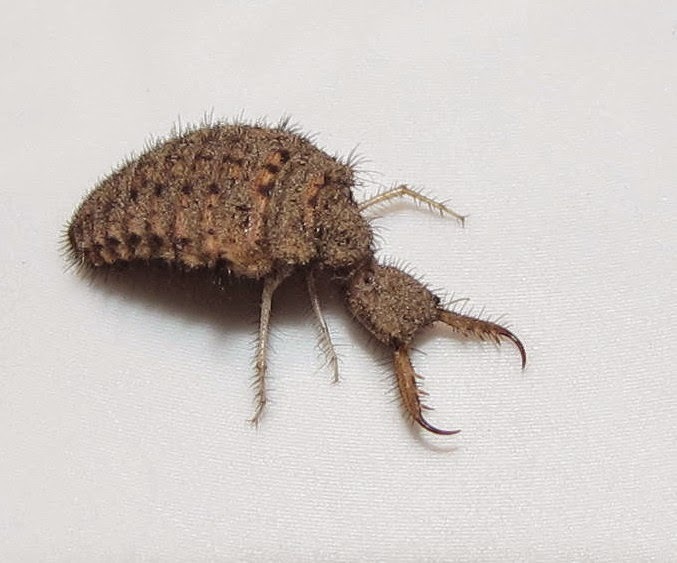 Antlion larvae might be considered among the ugliest and/or most terrifying of insects, and indeed they must be to their victims. Most are about the size of a large pea, but they are wrinkly, studded with spines, and with spindly legs. Their most remarkable feature is a pair of long, hooked mandibles. Ironically, these mini-monsters are best known by the cute moniker of "doodlebugs." They can create random, cursive "doodles" in sand in the process of finding a new place to dig a pit, and that may be the source of the colloquial name. 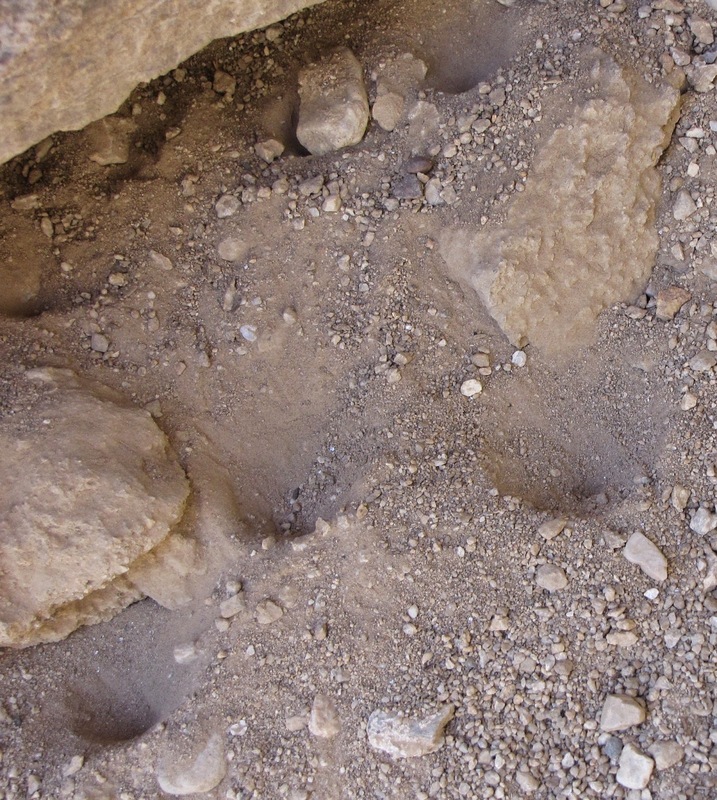 Actually, it is only larvae of the genus Myrmeleon that make the trademark pits here in North America. Pretty much all the other genera simply bury themselves just below the surface of the soil and wait with jaws agape for a hapless insect to pass by. Myrmeleon larvae can only walk backwards, but they do so rapidly. They dig a pit by walking in reverse, and in a spiral, throwing sand with their jaws and the flattened top of their head. They then lie in wait beneath the soil at the very bottom of the pit. The sloping sides of the funnel are highly unstable and any small insect that reaches the lip of the trap begins descending immediately. The larva senses the vibrations and throws additional sand onto the victim to hasten its doom. 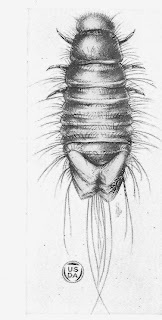 The jaws of a doodlebug are hollow, and the larva injects a cocktail of enzymes that paralyzes its victim and begins extra-oral digestion of its tissues. The doodlebug then reverses flow, imbibing the liquified innards of its prey. The resulting dry carcass is then catapulted out of the pit with a violent thrust of the antlion's head. Doodlebugs more than make up for the horrid appearance of their youth by metamorphosing into delicate, slender, lacy-winged adults that superficially resemble damselflies. 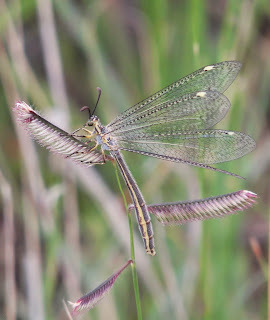 These fairy-like insects fly clumsily, and are most often seen among tall grasses, especially at dusk. 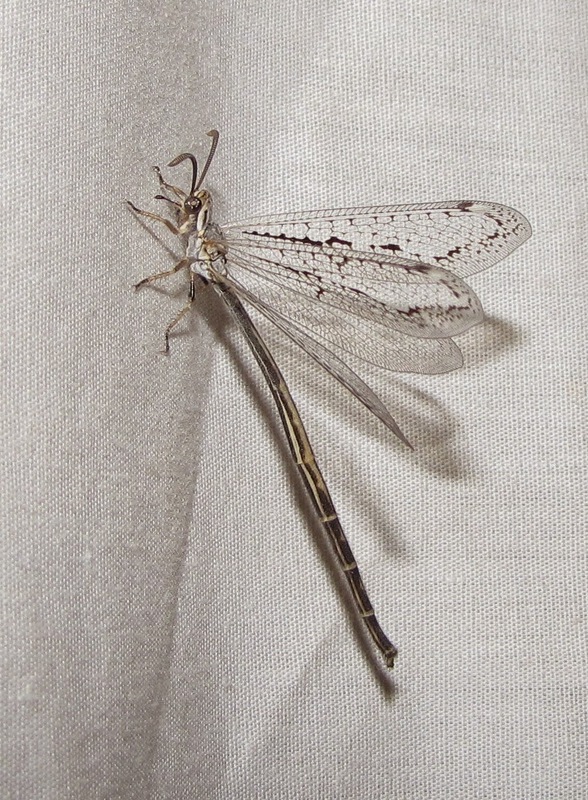 Note the short, thick, clubbed antennae that instantly distinguish them from damselflies. Males frequently have a much longer abdomen, tipped with bracket-like claspers. This is especially true of the genus Scotoleon. 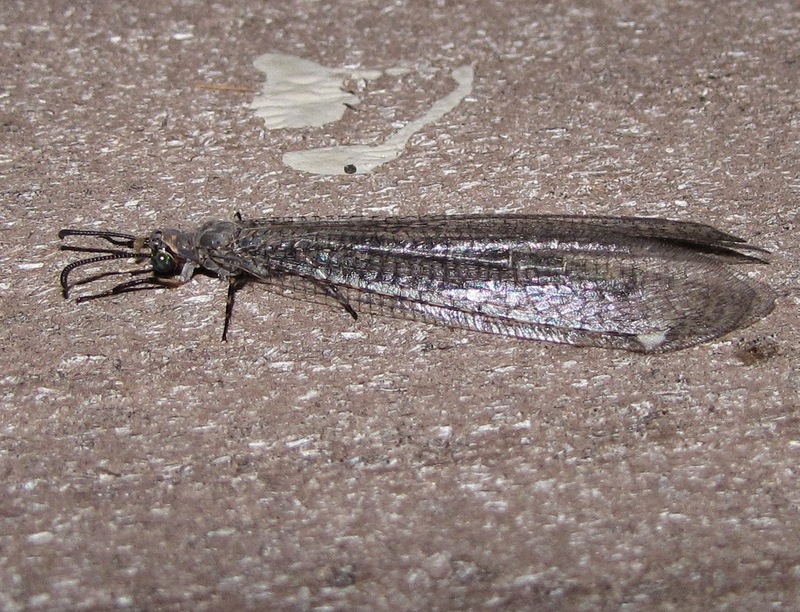 Despite the fact that adult antlions are fairly large, they are ridiculously cryptic. I have personally witnessed flying antlions alight on grass stems or twigs, and instantly align themselves so perfectly as to be essentially invisible. Dark spots and speckles on the wings break up their outline, but they also flatten themselves seamlessly against the substrate. There are eighteen (18) genera of antlions recorded north of Mexico, with 94 species. Some are truly spectacular, like the three species in the genus Glenurus that sport black, white, and pink wingtips. The genus Vella includes three species, which are true giants. Adults have a wingspan of 100-120 millimeters or more. They are found in about the southern third of the U.S., and are frequently attracted to lights at night. Look for the larval pits of Myrmeleon in fine, powdery soil, or sawdust around rotten logs. Where there is one there are usually several. Prime situations for such colonies are at the base of trees, beneath rock overhangs, under bridges, the dirt floor of old barns and sheds, and any other situation that remains perpetually dry. They can be in exposed situations, but I find that is rarely the case. 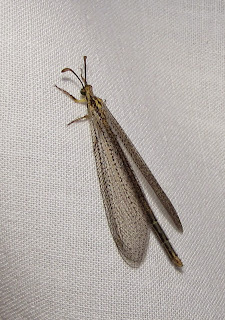 Watch for adult antlions at your porch light at night. You can tickle doodlebugs at the bottom of their pit with a grassblade or twig, and get them to throw sand or grab the offending object. You can also keep them in captivity by providing a fairly deep container of fine sand and periodically dropping in ants and other invertebrates. They can take down surprisingly large prey. 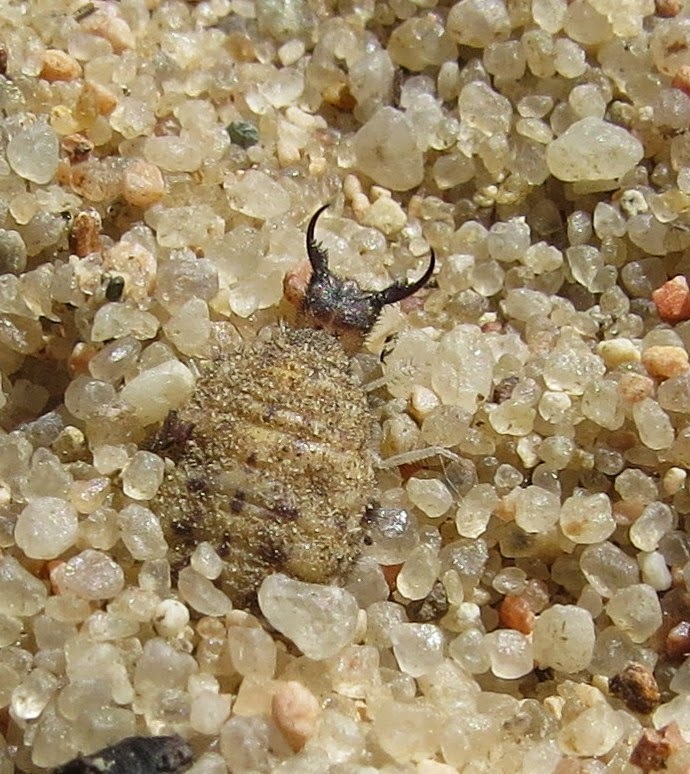 Antlions pupate inside a silken capsule the larva spins underground, incorporating grains of sand into the cocoon. 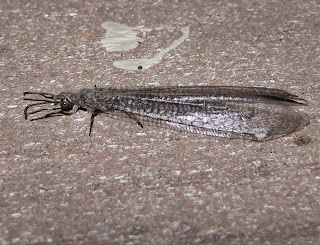 Enjoy looking for, and observing, these amazing insects, then share your story here, on Facebook, or elsewhere, like The Antlion Pit (though I am not certain this is still an active website). 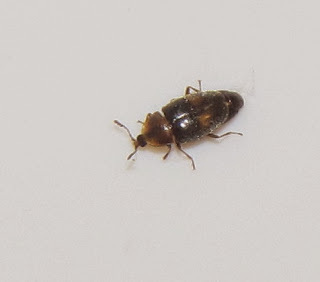 As a volunteer answer-man for AllExperts.com, I receive many questions pertaining to carpet beetles, tiny coleopterans in the family Dermestidae. In fact, I venture to say that at least seventy percent of the queries I get are related to carpet beetles and their larvae. Ironically, I now live in a region where these beetles are relatively scarce. Yesterday, I finally found a living larva of the most troublesome genus most people find: Anthrenus. 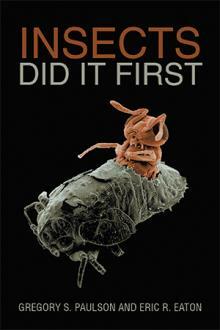 The hairy grub was only about four millimeters in length, and crawling up the bathroom wall. This is an unfortunate commentary on our housekeeping habits, I suppose, but even the cleanest homes will have carpet beetles at one time or another. It takes precious little to feed them. Carpet beetle larvae eat all manner of dried animal products, especially the shed hair and skin cells of pets and people. This food supply accumulates faster than you might imagine and, despite vacuuming regularly, can persist in out-of-the-way corners and beneath furniture. Additional items on the carpet beetle menu include wool blankets and garments, furs (but you don't have animal hides, right? ), taxidermy mounts, dry pet food, and insect collections (including my own, horror of horrors!). Getting rid of an infestation of dermestids is a real challenge. Traditional methods are of questionable effect. One of my good friends in entomology and pest control, Bill Warner, has found that moth balls, which have the active ingredient of naphthalene, are not just useless. He has observed carpet beetle larvae eating the substance. Ok, so what about moth crystals, with the active ingredient PDB (paradichlorobenzene)? At high enough concentration, that seems to work, and I have used moth crystals to protect my own insect collection. Unfortunately, PDB is potentially carcinogenic, according to the World Health Organization. The U.S. Environmental Protection Agency claims it is "not likely to be carcinogenic to humans" (National Pesticide Information Center website). The best course of action when faced with numerous carpet beetle larvae is to discard the infested item. If you cannot bear to part with whatever is under attack, then a cycle of freezing and thawing over the course of several weeks may do the trick. This is how most museums now handle pest control in their entomology collections. Prevention is the best cure for dermestids. Store vulnerable foodstuffs, like dried meats and dry pet food, in metal, glass, or durable plastic containers with tight-fitting lids. Store woolens, silks, and furs in a cedar chest when not in use. Cedar has proven repellent qualities and is not toxic to people or pets. Vacuum and clean your home regularly. Adult carpet beetles are pretty tiny (2-4 mm), and frequently mistaken for lady beetles since they are round, and often patterned with bands or spots of brown, black, and white. The beetles fly well and seek escape to the outdoors. Consequently, they are most often observed on windowsills, or discovered in light fixtures. 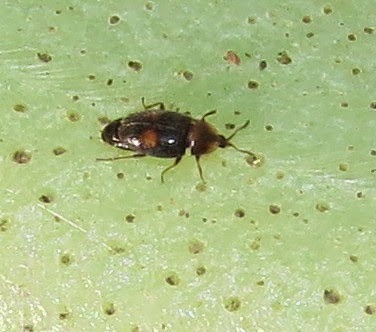 While carpet beetle larvae are pretty much "juvenile delinquents," the adult beetles can be surprisingly efficient pollinators of some flowers, especially in spring. 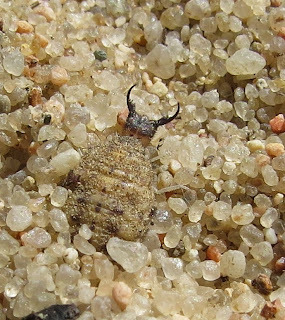 The Buffalo Carpet Beetle, Anthrenus scrophulariae, is particularly common in flowers. 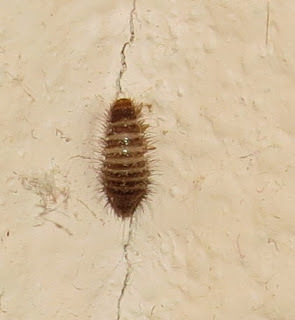 Carpet beetle larvae are covered in tiny hairs called setae, and these hairs can break off and become airborne, especially from the molts (shed "skins") of the larvae. These setae can cause irritation, or even trigger rhinitis or asthma in people prone to allergic reactions. Contact dermatitis is a more uncommon reaction, and an infestation has to be pretty severe to result in any kind of medical consequences (Peacock, 1993). There are eighteen (18) species in the genus Anthrenus currently recognized in North America, and several of those are cosmopolitan pests now found worldwide as a result of international commerce. There are other common types of carpet beetles as well, with the genera Trogoderma and Attagenus being common in households. I will address those in separate blog posts. Sources: Boone, Mike. 2013. 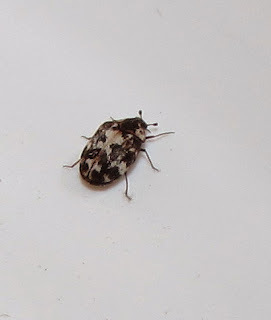 "Genus Anthrenus - Carpet Beetles," Bugguide.net. Gibson, Arthur and C.R. Twinn. 1931. Household Insects and Their Control. Ottawa: Department of Agriculture, Canada. 87 pp. Peacock, Enid R. 1993. Adults and Larvae of Hide, Larder, and Carpet Beetles and Their Relatives (Coleoptera: Dermestidae) and of Derodontid Beetles (Coleoptera: Derodontidae). London: Royal Entomological Society of London. Handbooks for the Identification of British Insects, vol. 5, part 3. 84 pp. 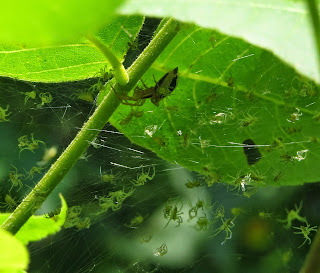 Spider v. Spider: A case of predation by Cesonia bilineata (Araneae: Gnaphosidae) upon spiderlings of Pisaurina mira (Araneae: Pisauridae)? When my wife and I were traveling in Georgia, we stayed at a bed and breakfast near Madison. The inn is situated on over 88 acres of farmland, forest, and river, and teems with wildlife from birds to insects. We spent the entire day of June 14, 2014 exploring the grounds. 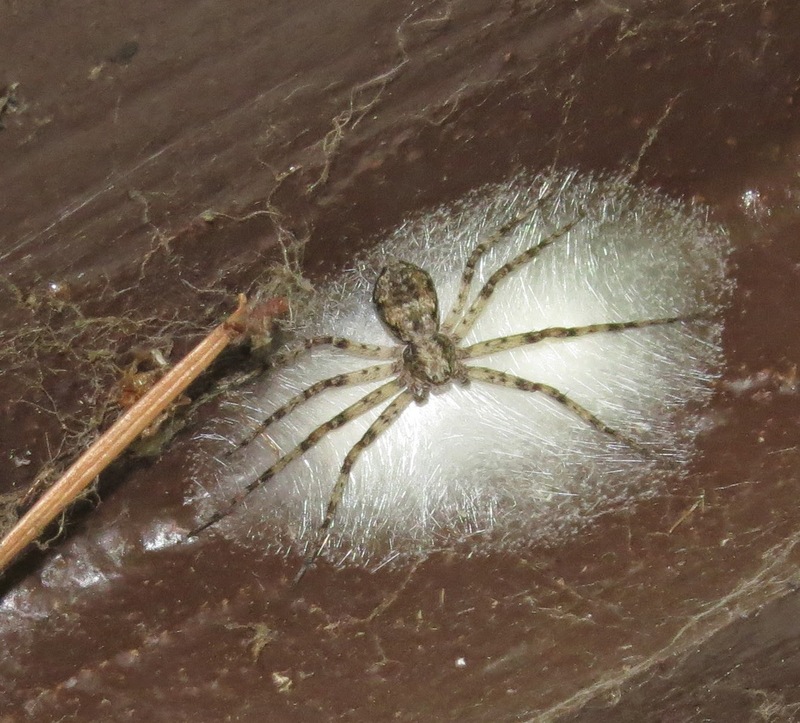 Along one forest edge I was fortunate to find a female nursery web spider, Pisaurina mira, guarding spiderlings. 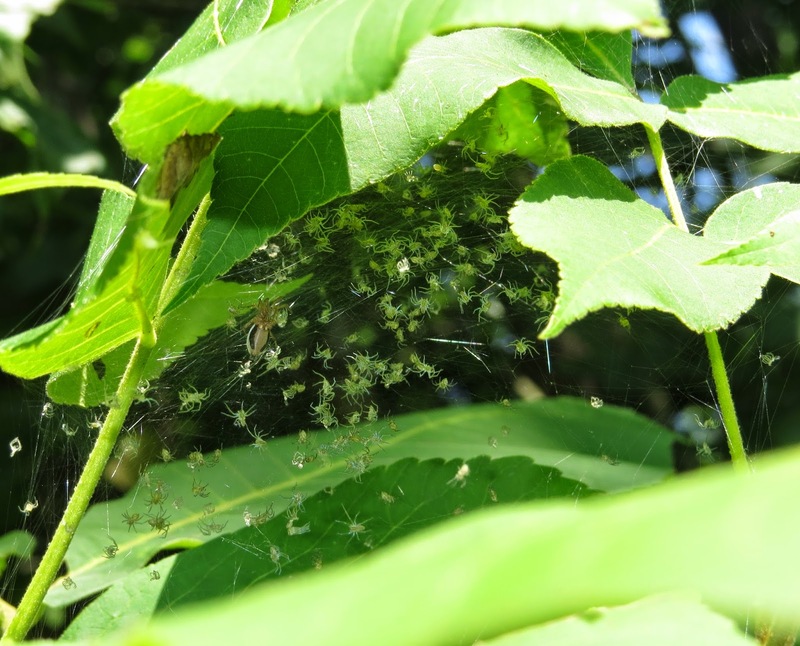 She was perhaps falling down on the job, though, as another spider appeared to have free run of the nursery web, feasting on spiderlings. A female P. mira is a formidable creature. She can measure 12.5-16.5 millimeters in body length, with an impressive sprawling legspan. Her size alone would seem to be intimidating enough. 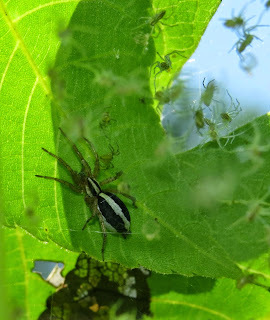 No matter, apparently, to a female ground spider, Cesonia bilineata, which was present in the nursery web among shrubbery well off the ground. 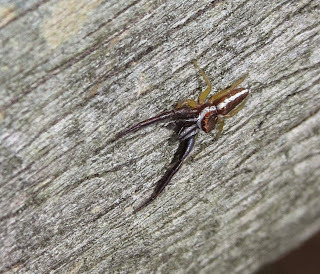 Adults of this spider are half the size of the nursery web spider, female C. bilineata being a mere 4.3-7.0 millimeters from front to back, and with much shorter legs. I did not observe the ground spider in the act of feeding on the spiderlings, but she was more plump than usual. There were living spiderlings and shed exoskeletons from spiderling molts present in the nursery web. 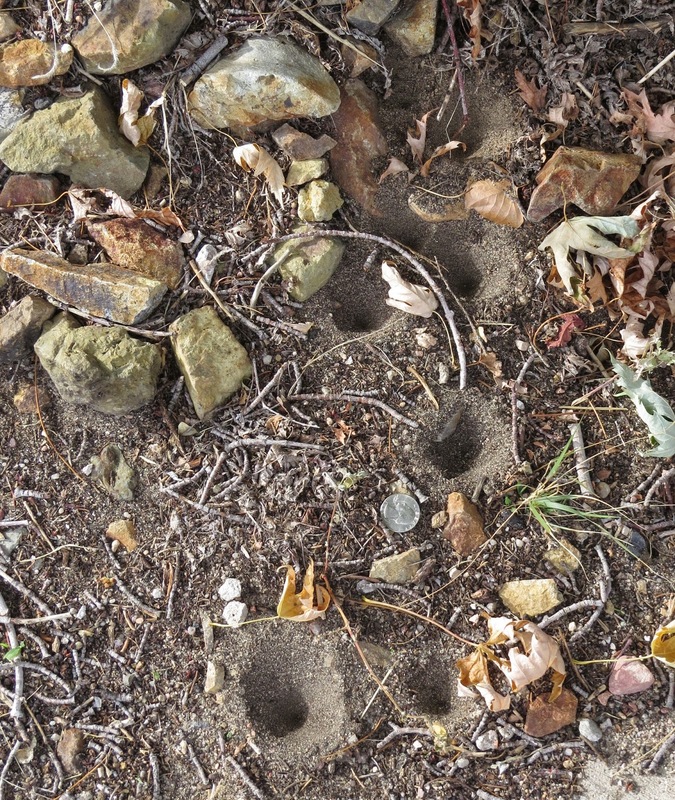 I also find it curious that so many of the "ground spiders" are highly arboreal, more likely to be found clambering about on foliage and twigs, or scaling walls, than to se seen scurrying over the surface of the soil. They are incredibly agile, too. Cesonia bilineata is a common, widespread spider in the eastern United States from New England south to the Florida panhandle and west to Nebraska. Look for it in wooded habitats. Willey, Marianne B. and Peter H. Adler. 1989. "Biology of Peucetia viridans (Araneae, Oxyopidae) in South Carolina, with Special Reference to Predation and Maternal Care," J. Arachnol. 17(3): 275-284. 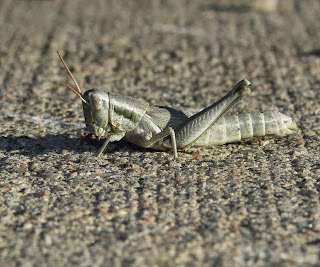 I recently came across a male specimen of the "legionary ant" Neivamyrmex nigriscens while walking our dog in our Colorado Springs neighborhood. It was instantly recognizable to me, but it got me thinking about how most people would be hard-pressed to know what it was. Unfortunately, there are very few references for the identification of winged ants. This is a shame because it is often the "alates," males and winged queens, that are most obvious to the public. Indeed, worker legionary ants are mostly subterranean and nocturnal in their habits (nomadic, raid the nests of other ants to prey on the larvae and pupae), so hardly ever observed by the average person. Meanwhile, a homeowner may not notice he or she has an ant "problem" until the colony swarms, liberating a cloud of alates. 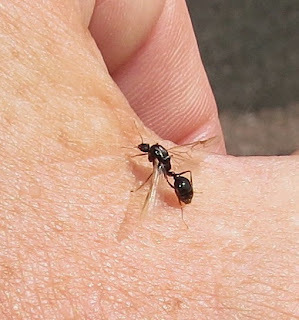 Alates are typically larger than the worker caste of wingless, sterile females, so are more noticeable for that reason as well. In many cases, the winged reproductives resemble the workers in general appearance, but this is not always the case. 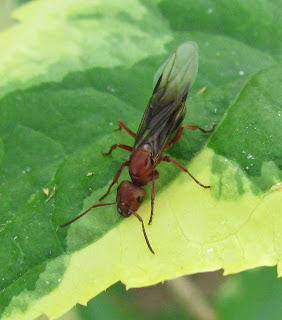 The thorax of winged ants is frequently greatly expanded to accommodate the muscles that operate the wings, giving males in particular a distinctive "hump-backed" appearance. 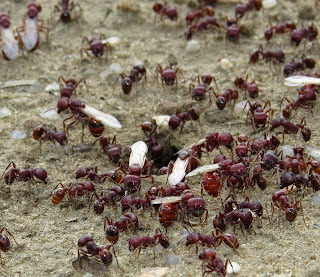 Swarms are usually seasonal, and triggered by changes in day length, relative humidity, and air pressure, especially in the arid southwest U.S. where the onset of the monsoon rainy season sparks many ant species to swarm. These emergences can be spectacular events. Worker ants open new exits from nests in the soil, and scour the immediate vicinity to rout any potential predators and parasites. Many swarm events take place in late afternoon, at dusk, after dark, or at dawn. 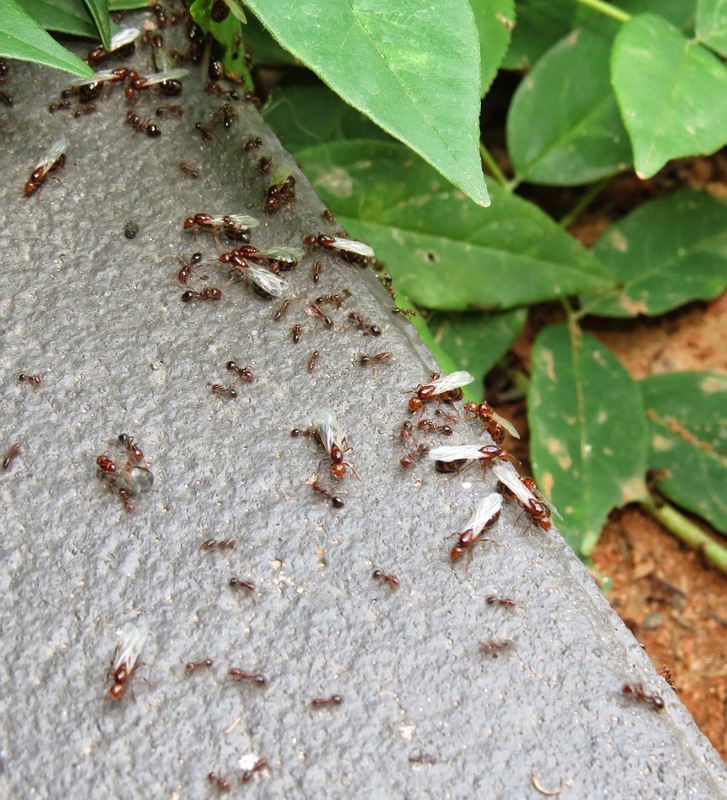 Winged ants may be attracted to outdoor lights, which can lead to the assumption that the ants came from the house or building when that is not necessarily the case. Colonies of a given species in a localized area swarm simultaneously such that members of different colonies can find each other and increase genetic diversity while decreasing the potential for inbreeding. Winds, and the insect's own muscle power, can take the ants far from their colony of origin. How do you know whether it is a winged ant or a winged termite? 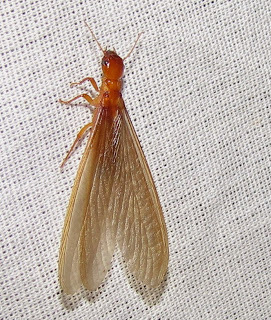 Please read my post on termite swarms for a concise explanation, and images of winged termites. 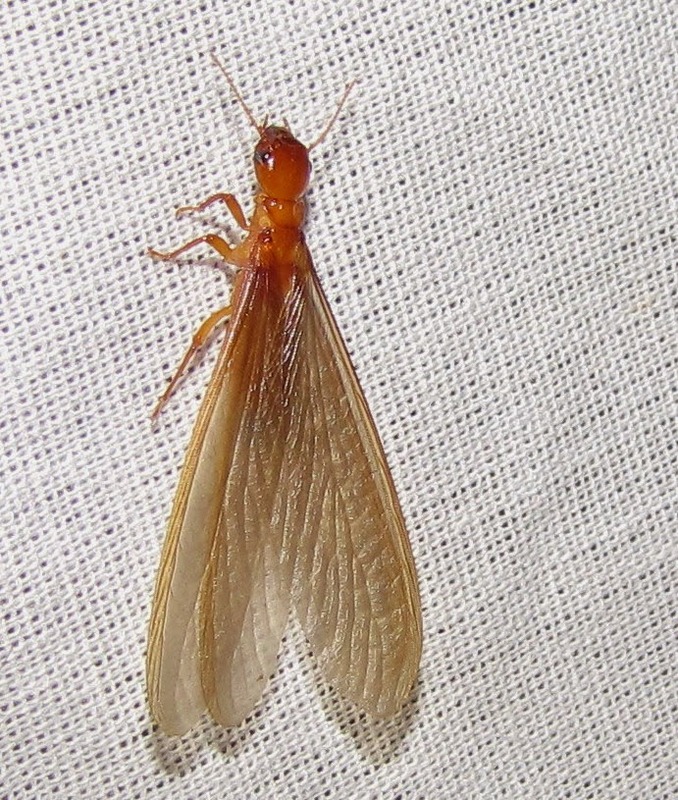 Below is an image of a winged termite to compare to the ants illustrated here. What about wasp versus ant? 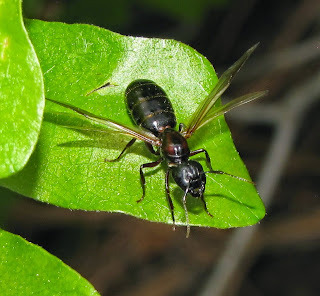 That is a more problematic distinction, but most ants have distinctly "elbowed" antennae, whereas wasps often do not; or at least the first segment of the antenna is not as long as it is in ants. There are exceptions, of course, like the male Neivamyrmex ant shown at the top of this post that has no obvious elbow in the antennae. Fortunately, I am not the only one who recognizes the need to pay more attention to alate ants in terms of research and public awareness. Laurel Hansen and Art Antonelli include a key to alates in their publication, listed below. 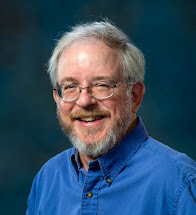 Brendon Boudinot, in a guest post for Alex Wild's Myrmecos blog, extols the virtues of studying male ants for a clearer understanding of the phylogeny of the family Formicidae. Sources: Boudinot, Brendon. 2013. "Male Ants Demystified," Myrmecos.Hansen, Laurel, and Art Antonelli. 2011. Identification and Habits of Key Ant Pests in the Pacific Northwest. A Pacific Northwest Extension Publication 624. Pullman, WA: Washington State University. 14 pp. Houseman, Richard M. 2008. "Ants." University of Missouri Extension. Back in the spring of this year, I broke the story of a new immigrant species to the U.S. that my wife found at the zoo where she works. The story is here, but today's post is the sequel. Initially, I thought that wasp might represent an isolated incident, a single specimen that managed to sneak over in a shipment to the zoo. That is clearly not the case now. Taking advantage of an unseasonably warm autumn afternoon on October 6, my wife and I went to Quail Lake Park here in Colorado Springs to look for birds and other wildlife. The park is in the foothills of the Front Range, not that far from the zoo. 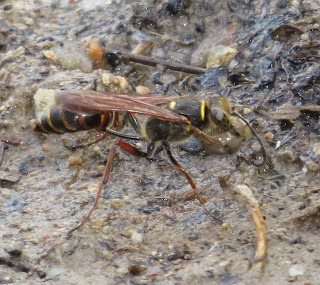 There, on the muddy shore of the artificial reservoir, in the dimming light of late afternoon, we saw a trio of wasps. Two were familiar natives: The Western Yellowjacket, Vespula pensylvanica, and the Black and Yellow Mud Dauber, Sceliphron caementarium. Heidi asked if the third, smaller wasp was also a mud dauber, and I answered yes, pretty much dismissing it as simply an unusually dark S. caementarium. I took images, though, and looking at the result I was both excited and crushed. Here was another specimen of Sceliphron curvatum, and she was clearly gathering mud to make a nest. This is pretty conclusive evidence that this Asian species is now established here in the U.S. Nearby the lakeshore is the restroom building for the park, and I wondered if this wasp had her nest there. Ironically, cliff swallows had built numerous nests under the roof over the "porch," but I could find no evidence of any insect nests, not even paper wasps. Some of the beams are hollow metal, though, and it is certainly conceivable that wasps are nesting out of sight. 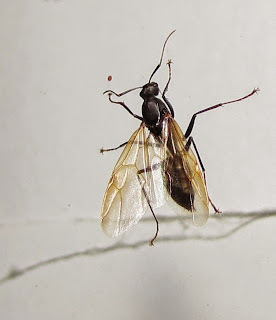 I suspect that Sceliphron curvatum exists in other regions of the U.S., too, particularly around the Appalachian Mountains, but has simply been overlooked. It may not be abundant yet, but that can change quickly. When I lived in Cincinnati, Ohio, I recall finding my first specimens of the introduced European Paper Wasp (Polistes dominula) to be a novelty in the early- to mid-1990s. 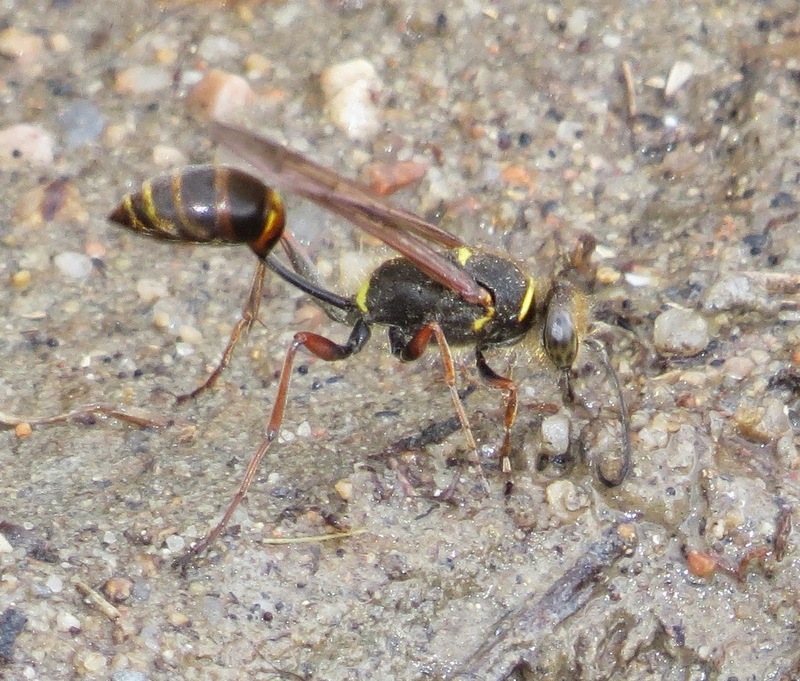 A few years later they were the second most common species of paper wasp I was seeing. 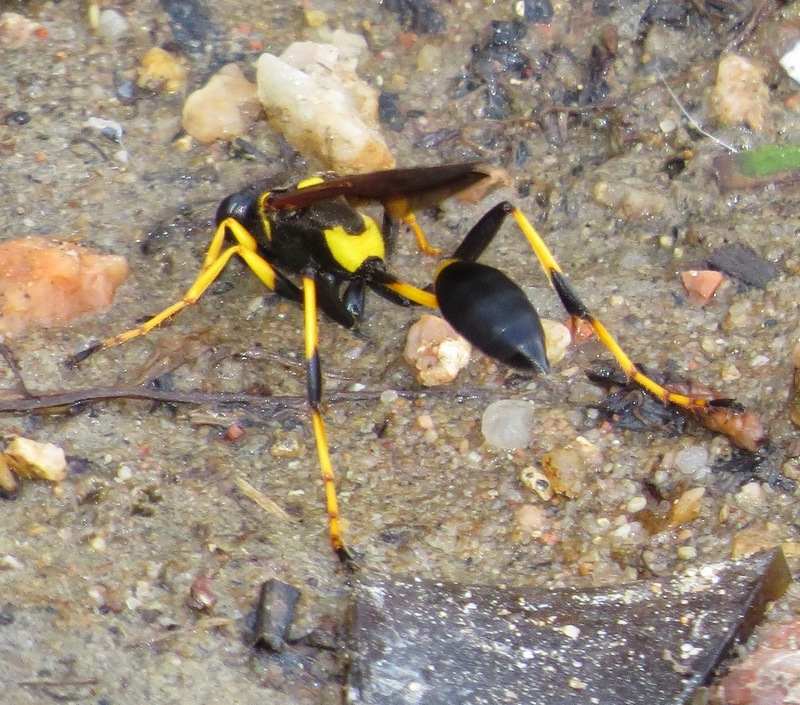 Again, I ask my readers to be on the lookout for this "new" mud dauber, and make your observations and images known through every means possible, especially social media like Facebook and Twitter where you are likely to get almost immediate confirmation or refutation of your identification. The more eyes looking out for unusual insects the better. Like your favorite horror movie trilogy, sequel, or whatever, Flickr's group "Arachtober" returns with a vengeance(?) this month. It has become an annual treat for arachnophiles and macro photographers, but perhaps a cruel trick on arachnophobes. This year's edition has special meaning for me because I have been contracted to write a new field guide to U.S. spiders for Princeton University Press. I am also responsible for furnishing images, despite having a small budget for image acquisition. Preceding authors of Princeton guides have set a high standard for image quality, and I feel an obligation to publish the best photos I can get my hands on. 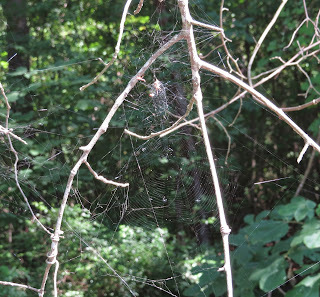 Web of Labyrinth Spider, Metepeira sp. Arachtober manages to recruit several new participants each year through word of mouth, blogs, and sheer curiosity. Not only spiders, but scorpions, ticks, mites, harvestmen, and all other arachnids are eligible for inclusion. The only hard and fast rule is that the image you post to the group must not have appeared on your own Flickr photostream previously. 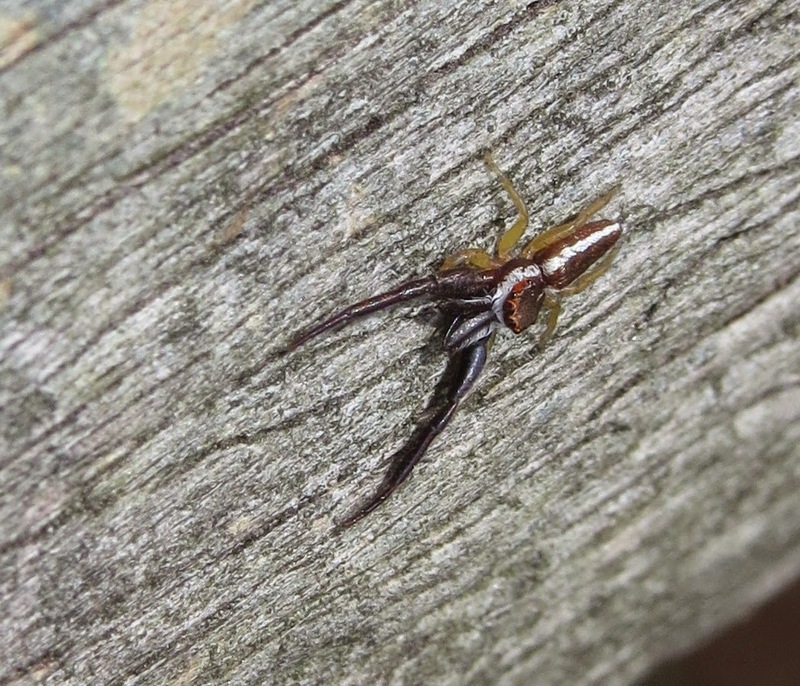 Overall, interest in spiders seems to be increasing among the general public. Judging by the many new groups that have been created on Facebook, turnouts at special exhibits like "Eight-legged Encounters," new blogs, and other indications, arachnids are achieving a much higher profile than ever before. This is great news, for there is still a great deal of work to be done to combat myth, superstition, misinformation, and fear. Please consider contributing to "Arachtober" on Flickr, or find another way to dedicate some time to sharing your spider observations, questions, or images. There is much you can contribute to our collective knowledge by doing so.